The cottages of Alabama Row are among the oldest structures at The Greenbrier, built in the 1830s during the resort's initial period of expansion. During that decade stagecoaches could finally travel to this location over reliable roads and White Sulphur Springs quickly evolved into the most fashionable summer social gathering place in the Southern states. 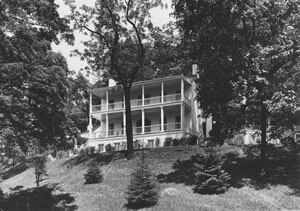 The Alabama Row cottages were some of the finest nineteenth century guest accommodations perched upon a ridge with a sweeping view over the resort's trademark icon, the Springhouse, and beyond to the contours of the Allegheny Mountains. Adjacent to these cottages proudly stood the very best site on the grounds, a two-story building that housed numerous VIPs over the years, including five pre-Civil War U.S. Presidents. Today this is the President's Cottage Museum. By the early 20th century all of these cottages were showing their advanced age. The Alabama Row cottages were restored in the early 1930s. Artists William and Natalie Grauer of Cleveland created an "art colony" in the units, that is, they brought their friends from the Cleveland arts community down to The Greenbrier each summer providing art instruction to resort guests in these cottages. Edith Bolling Galt Wilson-President Woodrow Wilson's widow- officially dedicated The President's Cottage Museum on August 22, 1932. 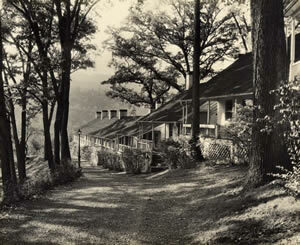 During the Second World War The Greenbrier Hotel was converted into a two thousand bed Army hospital and for four years these cottages served as residences for military nurses. In 1956 a British sculptor, Gladys Tuke, persuaded The Greenbrier's management to return to the art colony concept and she opened a studio and shop in Alabama Row. From that one shop has grown the Alabama Row Art Colony we know today.